Today's Rats Alley Workout (It's been quite a while!) involves the kettlebell. The lone, simple tool that works you out pretty intensely. Today's workout was a 10 minute Tabata series of 20/10 work/rest patterns, doing 1-Arm kettlebell cleans every 30 seconds, alternating arms every 30 seconds. I got 10 cleans in per side, 20 per minute, 200 total with a 35# kettlebell. It has been quite a while since I attacked the kettlebells on a frequent basis, but I have been adding in more swings, cleans, and presses every other day the past week. I kind of forgot about this blog and noticed its been almost 2 months since my last post, so its time to start blogging once again and keep up with things better. My road trips are winding down for college fairs and high school visits in the area, so blogging should be more frequent now. My newest project is starting soon in a couple weeks over at http://podiumpowersystem.com, as I'm starting up a motivational, virtual race, fitness testing system. If you are a runner, you will like what the PPS has to offer you! Check it out and give it a look: earn some Podium Power Bands and see where you are at before your next big race! If you're a part of the Kindle Owner's Lending Library (KOLL), give the books a look! Been quite a while since the last post, I went on a road trip and didn't have much time for blogging stuff, mainly worried about work on my trip. I mainly did a mix of bodyweight workouts with a door strap in the hotel, plus my kettlebell stuff. I would run about 3x a week on the road, with a running club run and my own run on Sunday as well. The door strap I got was at Walmart, it wasn't perfect, but it did the job for a brief workout of 1 leg squats, push ups, inverted rows, ab crunches, and back extensions. I also tried some mountain climber hangs with my feet in the handles. As always, my handy dandy GymBoss timer set for the 20/10 cycles did wonders with this workout. I had a lot of nice runs in a lot of Minnesota that my business trips took me on. My last run in Brainerd had a great run going right by the Mississippi River on a park trail. It was a great, peaceful run to bounce these ideas in my head that have been going strong the last month or so. I'm churning up ideas on a new running themed motivational program specific for runners. Its not ready, but it will be in a few months. I am brainstorming a lot on the idea and bouncing around ideas with other runners to get their specific perspective. I see a lot of good stuff with it and think it would really take off. Now that I'm back in Mayville with a new apartment and a wellness center just 2 blocks from me, its time to get back after some lifting for deadlifts and bench presses for sure. Just got my membership this week, so once I'm all settled into the new apartment, it will be time to go back to the "Comet Barbell Club" for some good old workouts once again. My membership gets me into the athletes' weight room as well, so I'm looking forward to some 6am workouts under the bar once again. This weight room was where I mainly discovered the "Indestructible!" program that's outlined in "Just The Workouts" and charted in the "Just The Chart" workout guide for 1 rep maxes and their corresponding weights for sets/reps needed in the Indy program. In the meantime, I'm getting in a lot of good runs in the morning and KB Swing workouts too. Looking forward to a mix of barbells, kettlebells, and speed workouts. Once I get more settled in, I will also look at some private coaching for runners in the Mayville area. This is the best transition I can see myself doing instead of trying to go full bore into personal training again. I wouldn't mind doing some online workouts in that capacity but I still love the personal workout atmosphere. Private coaching as a 'track coach' for serious runners is right up my alley. The blog posts are once again sporadic at best lately, making some changes in the future here with a move to where I'm working now and trying to finish up stuff at my old house. Not to even mention packing and cleaning through stuff I have. In sections of my house, I discovered all the old track workouts and binders I've collected through the years of coaching. I did turn a lot of those into Kindle guides now, so there really isn't a need to hold onto the junior high track meet results from May 5th of 2010. :) Most of these solid workouts are in my "Just The Track Workouts" guide at http://tinyurl.com/rkofp The new Kindle Unlimited program is really doing well for my guides, since a majority are on the KU plan. I am looking at some private coaching once I get settled into my new place, and things settle down on the other end of trying to sell my house as well. Looking at my work schedule, I'm not sure how it would go, but I could do a lot of distance coaching online with some people too. The coach in me still wants to go, but keep it pretty simple as well and easy to manage. I know plenty of runners who might have an interest in some additional help with their running plans and race objectives. In the meantime, I am getting in some solid workouts in the wee morning hours, sometimes with moonlight to begin with, followed by the sunrise as I end the workout. Its also a lot cooler in the mornings and pretty peaceful. I really missed morning runs for a lot of years unless it was on a weekend. Now that my workday is starting later, I have the time to do this and I'm thankful for it. I know its time to start lifting heavy with the kettlebells too. I've took off a lot of time from the KB's and after a couple weeks now of readjusting to them, I'm set to get after them again. That's one great thing I tout about with the HWR plan, is that even though its all bodyweight on the videos, you can sub new exercises in for some of the same movements with KB, band, or dumbbell exercises. You're not just stuck with 51 workouts (which is plenty to begin with, can P90X give you that? nope!) but you can make them more challenging if you need to. The past week was a mix of lifting and running workouts. With the new job, I have more time in the mornings to workout now and its been a nice boost to the day to start things off with a workout. Monday was an HWR day of a 10 minute circuit. I really love the HWR circuits, as they are brief, intense and short on time for effectiveness. Tuesday and Thursday were track workouts. Tuesday I did some 100/100's, which is easy for 100, hard at race pace for 100, in a continuous fashion. I started with a 1/2 mile warm-up, then went into the 100/100's for 6 laps worth (12 cycles of 100/100's). Thursday was the 2nd track workout of the week, with 200/200's. That started out with a 1/2 mile warm-up, followed by 2 miles worth of 200/200's, getting under 7 minutes a mile in my mile pace for the 2 mile portion on the track. This workout felt like a good mimic of a 5K pace, since you may be alternating paces quite a bit in some races due to hills, wind, and other race day happenings (such as getting around people in a surge). Wednesday was just an easy run, going 2.5 miles on the Finley 5K route. I didn't do the whole route of course, but finished up 2.5 miles in under 20 minutes for a nice, solid, steady pace. Friday was another HWR day, mixing in my kettlebell with some Swings and Cleans for some portions of the circuit. I like mixing in kettlebell exercises with the HWR videos a lot. Are you a Kindle book reader? The new Kindle Unlimited plan is a nice boost for my guides, as a majority of them are on the KU plan now. "Just Swing It!" is taking the lead overall as the most downloaded in the KU plan this month so far, as well as last month. The race weather was pretty calm, about mid 60's, but a little humid and it got a little more hot/sticky as the race went on. 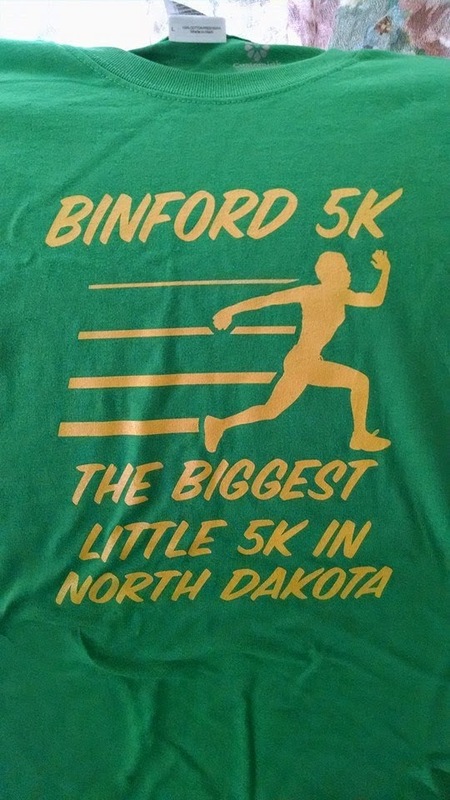 The course went in and around Binford, then back into town for the finish. My GPS had the course at 3.23, so it was almost 3 and a quarter miles. I finished in 1st with a 21:56 time, making it my 2nd win ever in a 5K race. My first one was in 2010 for the Finley 5K right in my hometown here. I did glance at my watch as 3.1 came about for a 5K estimate, and it was right at 21 minutes, give or take a few seconds. Pace wise, I think my first mile was about a 6:40, 2nd mile around 7 minutes (13:40 on the watch) and the last mile & a quarter was over 8 minutes. Last mile felt slow but maybe its because I had no one to go with or chase, since I was in a comfortable lead. 21 minutes at the 3.1 mark though, I was pretty happy with for a humid day. I am getting better at keeping a steady pace for the 2nd mile, and better control over the first. Many times I'd burn out a 6:20 or faster for the first mile, and then slow down for a 'recovery mile' over the 2nd, and try to hit a final charge over the last 1/3 of the race. Both 5K's now have felt pretty good in this pacing sense. Not sure what else is on the schedule coming up, there will be a few more around Fargo that I may have an interest in doing this fall. My college also should have one coming up in the fall too. For now with my new job change, I should have more opportunity to workout in the mornings as well as evenings. Planning more runs and KB routines to get through. If you get a chance to do some small town 5K's, they are very fun to do. Its a good mix of walkers and runners and just the social nature of them are really great to experience. Just wanted to share yesterday's routine I did at the track in the afternoon. It was a mix of traditional and my new 'subsonic' pattern of lower rest periods. In a traditional sense, I will usually do a 1:1 work/rest pattern when it comes to intervals. In an example of this, I would do a 400 in 90 seconds with 90 seconds rest, mainly doing one every 3 minutes in this fashion. Even if I got under 90 seconds, such as an 84 or 85 second 400, I'd still rest until 3 minutes hit the watch. In my new 'subsonic' patterns, I greatly reduce the rest time and work under more fatigue. Following the 84 second 400 example, I would rest only 36 seconds and go every 2 minutes for another 400. Yesterday was a mix of these two, as I decided to do a 400 every 2.5 minutes, effectively getting in 800m worth of distance every 5 minutes this way. Turned out to be about 1 minute rest between sets of 400's. 200m in 40 seconds, rest 40 seconds, x 4. This is 4:40 worth of time to spend in doing 800m worth. Its a 1:1 work/rest pattern, and I've found its a good finisher to end a workout on with shorter speed intervals. With the 1/2 mile of warm-up I did before this, it was a solid 35 minute workout for total time spent on the track for 3.5 miles worth of running. If you are looking for a bank vault of speed workouts, my 'Just The Track Workouts' guide book is quite a collection of what I've produced. I used to have all these guides as single Kindle guides, but decided to combine them all into one resource. JTTW is also a part of the Kindle Unlimited program, so if you're signed up for that, give it a read. I finally had a 5K race this past Saturday, finishing 2nd with a 21:37 time and feeling pretty good for the most part. First 2 miles of the race went really smooth for me, even though it was a guess, time wise, where those marks were. My GPS did not work on Saturday morning, so it was basically by total feel. The last 3/4's of a mile in the race was into a wind and that taxed me more than I thought it would. It wasn't quite the time I wanted, but I will take a 2nd place finish and medal that went along with it for a start to the 5K season for me. The last 2 days I've been riding a lot, doing a 10 mile ride on Sunday and 8 miles on Monday afternoon. I rode on Sunday on all pavement, Monday was mostly on gravel and prairie roads. I'm planning on another 5K on Saturday morning too. Going to hit the kettlebells today as well as the track. Will be using the 20/10 format of the HWR programs and follow along with a video of a 10 minute workout to do a mix of KB, band, and bodyweight stuff. Speaking of KB's, I have seen the new Kindle Unlimited option become a positive thing for my guides recently. JSI and KBXL are improving in sales and total borrows. I think the rise of Crossfit workouts and such have given kettlebells a new avenue. Even though I am not a CF fan of their workout formats and style, it does give people another avenue to get introduced to kettlebells with some of their workouts. I know KB's are here to stay and will not go away. Those who train with them, such as myself, have discovered the benefits of their use for our training needs. I love them a lot just for the metabolic workout capabilities of them. Just Swing It! was a big part of that discovery, in doing two, 10K+ challenges in two months time. It helped me reduce body fat and boost my running in a time of the year that is hard to get runs and speed workouts in. JSI is still my top seller, but KBXL, its 'sequel' in a way, is also getting a boost in sales too. Both books can be bought for just under $4 for some solid programs to follow. I'm making a new change in careers, as I leave the custodial and coaching worlds and move into the field of college student recruiting as an Enrollment Services Rep for my alma mater soon. I still plan to keep up with Kindle guides and stick with coaching in a private role, primarily with runners. I will no longer be coaching youth sports and will have more time for more intensive workouts and other adventures. I will still keep this blog going and maybe once I get settled into my new job, I will start doing more daily or semi-daily posts each week with workouts and tips. The Rats Alley Barbell Club is going to continue. Its a good blog that people come to for my free programs and other information on the programs/guides I sell through it. Now that I'm going to be on more of a basic, everyday schedule with things, I think I will start doing more KB routines and once I get into a gym membership, I will hit the barbells once again with fury. Running is still a high passion and you'll get some good workouts coming soon. The Subsonic routines I've come up with have been really working well and will get tested over the next 2 weekends with 2 area 5K's. My mile time is right where it should be on an open mile road race, and might get tested again. You may have heard of the new Kindle Unlimited service out of Amazon. Its $9.99 a month and you get access to over 600,000 titles of books to read. I am happy to announce that 12 out of my 13 guides are eligible for this new Kindle Unlimited subscription service. So, if you are a part of Kindle Unlimited, you can check out 12 of my 13 guides through that program. I have intentions of making a new guide on the Subsonic workouts I've been testing out. Should have more free time as well to create other guides in the future. 3 Minute Warning: 20/10 x 6, or do all 3 minutes as an ultimate finish to the routine. KB Swings, 1 arm at a time, alternate every 10 reps if going for 3 minutes. Switch arms every 20/10 period if doing 20/10 x 6. I had a decent day on the track, despite temps in the 50's and high winds, plus no sun in sight. Just miserable weather for July 1st in ND today. Anyways, I wanted to see how I'd handle a mile trial on the track under such crappy conditions. Got 5:55 on the clock. Rested 4 minutes and then did an 800 trial in 2:55. Rested 3 minutes, did a 85 second 400. Rested 1.5 minutes, and then did my final 400 in 79 seconds to finish it. Happy with my times overall, under 6 on the mile and under 3 minutes on the 800. Would like to see what a fresh 800 would be, expecting around 2:40-45 if I am fresh. Sounds like a good future workout for me. Looking for a simple challenge to try over July? Take on the Just Swing It! KB Swing Challenge! 10,000 Swings in 31 days. Just try to average around 1000 every 3 days. Ways to split this up? Of course, there are multiple ways to split up 1000 swings over 3 days. 100 swings can usually be done under 5 minutes of time, I prefer to go every 4 to 5 minutes with another 100 every time interval. The smoothest way I've done 100 or more in straight sets is to do 10 swings per arm and keep switching until you hit your goal of 100 or more in a set. Its time to get back to basics and add something new in the process. I'm going with a kettlebell focus with the "Indy" plan, or "Indestructible" plan that I covered in Just The Workouts. Its a blend of the basic barbell lifts (Bench, Squats, Deadlifts) with kettlebell exercises to finish things out. If you have an assortment of KB's to choose from at your gym or home, find the right weight for each KB exercise as is appropriate to complete your reps and not totally tax you by the end of each set. Leave a rep or two "in the tank" as they say. Use the 3-Minute Warning as your finisher to the workout. If you are looking for brief, effective workouts to do in-between these workouts, I highly suggest the Home Workout Revolution series from Craig Ballantyne. These workouts are still a good selling item from the blog here, as people are finding it to be a high quality, affordable product in comparison to other home workout programs out there. I've touted the benefits of the HWR 20/10 workout series many times on the blog here. If you want 10-15 minute workouts that are bodyweight only (and could be easily subbed with bands/dumbbells if needed), HWR is your solution. http://tinyurl.com/cbhwrevsale is the place to go. Compared to P90X, (1, 2 or 3), Insanity, and other highly overpriced programs out there, HWR is your best, most affordable option, hands-down. Over 50 videos alone to download/view and even burn your own compilations of (like I've done many times) make this program a breeze. In comparison, if you'd buy a P90X plan, there are about a dozen DVD's you'd have to fish through and always load into your players. HWR has videos you can play from your laptop, tablet, phone, as well as the ability to download the videos you need onto just 1 DVD to load up and watch. A lot of programs cost more and don't even have that option for you! Its been a long while since my last post, as I've been busy with preparing for races to direct and also time. After taking on the Finley 5K and doing the Finley Tag Team Relay Race last year, this summer has really grown on the race directing side of things. I have taken on 2 more 5K's, timing for a 5K/10K event, and also added another Tag Team Relay Race to the calendar. I'm learning more as I go and trying to develop a good system for all events to run as smooth as it can. With all this preparation time, its cut into some workout time for sure. About two weeks ago, I bought a new 'fat bike', a special all-terrain bike that has 4" wide wheels on it. It really looks odd compared to other regular bikes. When the tires are twice as wide, they almost look like a motorcycle tire. The one I bought was from a local discount store, one you'd consider an 'entry level' bike to the fat-biking craze. It was the Mongoose Brutus, a single speed fat bike. My first ride was for 10 miles and it was a very fun ride to go on. With my GPS on, I was getting 10-12 miles/hour on the bike, even with a single speed only to go on. Hills were tough, but temporary. Downhills were a brief rest. Overall after my first ride, I was thinking it was a fun purchase for some enjoyable riding. Not quite the case: on my next ride, just a quick 4 mile loop I did outside of town, I started hearing pops and squeaks in the frame. Some online questioning on facebook groups and reading reviews on it, the bike itself was either the world's most awesome bargain for a fat bike, or a bothersome bike where you'll spend more time fixing than riding. The latter was the case for me: I tried adding grease to the bearings, and although the wheels rolled smoother, I really heard some squeaks/pops just taking it throughout the streets by my house. Online posters about my questions on the bike's issues said "Take it back" in unison. So, I took it back, the store looked at it, and I thought I heard a slight squeak again. I decided to take it back home and give it a longer ride than just the parking lot. After going around the block, and after numerous tweaks with the wrench, the pops/squeaks got a lot worse. And my fat biking experience ended the next day. I swapped it out with a regular mountain bike, a 29" Schwinn High Timber bike. Will I go back to a fat bike? It will depend on the price of what I can find and afford. I feel the bike I got was one of those that was rushed, put together just to fill a niche, and sold at a discount rate to make it a mass appeal bike . It may be good for beach cruising, but for grinding up the gravel roads around my neck of the woods, it certainly couldn't handle much. In comparison, I have had a Schwinn OR2 hybrid bike, a bike made for gravel & pavement conditions (almost mountain bike-like tire but with a smoother, slightly thinner look to go fast on pavement when needed) for two years plus... and haven't heard one squeak out of a few hundred miles on it. That's why I decided to stick with another Schwinn for my riding needs. Upon further reviews, if I decide to get another fat bike in the future, there are others in the $500 to $1000 range that I could save up for and would have a better quality build to them. The high end ones are $2-3K and is a bit out of my range for my need. I have seen some fat bike pages on Facebook where people will take the $199 Mongoose Beast (found at Walmart) and basically use it as a 'hot rod' bike to build up. Some people will modify the rear wheel's cog to make it easier to pedal. Others will even drill holes in the bike's rims to cut weight on the bike itself. I guess if you have the time & money, plus patience, its a bike where you could spend $200 at first and another $2-300 or more to soup it up. I just don't have that time or the handyman skills to soup up a bike. So, for now, I will stick with gravel grinding away on my OR2 or try some roads out with my new High Timber. As for running, I took about a 6 day layoff from running, and when I returned to the track, the Subsonics were hit again in 400m segments every 2 minutes. I told myself to hold back a bit, and aimed for 90 second times. 90 second intervals with 30 seconds rest felt easier than I thought. I think that's a good sign that the Subsonic interval routines are working well. I'm still doing the Subsonic workouts lately, getting at least 2 in each week, with another slightly 'tamer' speed session. In between, I've been getting in some longer bike rides for recovery from these workouts. I like how my legs aren't quite so dead after a steady bike ride, and they feel fresh the next day for another session on the track. I've been doing this a lot the past couple of years, alternating long bike rides with hard track sessions during the spring, It all depends on how much time I have each day for the rides, and even the track sessions. As an average, I usually have a good 30-45 minutes, sometimes an hour now, for a decent workout session. Bike rides usually are for 30-45 minutes, track sessions mostly 20-25 minutes on those days. After seriously looking at how much gluten is in my diet since January, I've finally hit my target weight for what I wanted. I've tended to race very well around 180 pounds throughout the years, sometimes 175 when I was in my 20's. I feel much better now and I know the diet changes have made a huge difference in not just my weight loss, but in how my body performs. I'm doing pretty much the same workouts and the diet really helped things move in the direction I've been waiting to move forward in. Just doing the Subsonic workouts with brief rests between sets has made me more aware of what I'm capable of now. Hard intervals are still hard, but its starting to feel a lot easier than in the past. For now, I won't be posting weekly workouts, maybe just brief updates on my own stuff, or something new that I come across. I am getting into 5K race mode with the races I'm directing and helping to manage with timing, awards, etc. Won't have a lot of free time soon to keep up on the blog more frequently, so for now, if you're looking for programs, check out the free ones I have in the tabs, such as the BSD plan and the 5,000 Swings program. Of course, my Kindle guides are still available and most of the tabs cover those as well. I not only sell my own stuff, but also sell Craig Ballantyne's HWR program and Mike Whitfield's Workout Finishers program, and the well-thought-out CT-50 plan that's better than CF, in my opinion. It's been a long time since my last post. Mainly, track season got in the way in a hurry and whatever free time I had, it was eaten up with other things. Its done now, but I'm also gearing up for area 5K's that I'm directing. Workout postings have been sparse. Still not sure which direction to take it in the future. I'm kind of a hybrid and out-of-the-ordinary person when it comes to workouts. I enjoy traditional stuff like RABC bench, squats, and deadlift stuff. I am also an advocate of kettlebells and all they offer. Bodyweight exercise circuits are also a part of my 'thing' when it comes to training, and let's not forget running workouts. Big fan of the Track and what a good old track workout can offer you. Here's a simple to do Track workout that I've been experimenting with this month. I call it "Subsonic" because you are going at faster than race pace, like a 5K pace, with very minimal rests. This workout is best if you can do a 400 in 1:30 or less, and also 200m in 45 seconds or less. For me, I can cover 400's in 80-85 seconds in repeat mode, and 200's in 38-40 seconds in repeat mode. I got the idea for the workout after doing 20/10 Tabata's so much with the HWR workouts and also with KB workouts. Everything cycles around 4 minutes of total time it seems. It also follows a 2:1 work/rest ratio. So, I decided to try the following and see what kind of times I could produce on the track in this work/rest ratio format. Since my 200's were basically in 40 seconds on average, I'd figure I'd rest 20 seconds and keep it simple by doing a 200 every minute. 4 rounds of this takes only 4 minutes, and you get in an 800 in distance volume, plus its done in about a 2:40 time of total time in intervals. I started out with doing this for the first 4 minutes, then taking 2 minutes rest, and doing it again (on a running clock, I simply rested 2:20 after 3:40 of interval times, following that 40/20 work/rest pattern). This means when 6:00 came on my watch, I started it again with another 4x200 effort. This mean little workout gives you a 5:20 mile, once intervals and times are added up, in about 10 minutes of time. I also tested this out with doing 400's every 2 minutes. I'd get 1:20-1:25 of time to run my 400 in, then rest until every 2 minute mark came about. 4 of these can be done in 8 minutes, and you have your mile done. The workout I did with the track kids for a speed workout took about 16 minutes to do. We mimicked a 'very fast moving' track meet this day. Typically, a distance kid will do one leg of a 4x800m race, so we did 800m worth of a 200 every minute. We then rested for 4 minutes, and then did 1600m worth of 400's, doing one every 2 minutes. The 1600m race is typically next in line for the distance runner at a track meet. Most of the kids were doing the 400's in the mid 70's to early 90's for time. A big benefit of this workout is you are learning to control and manage your speed while you are pretty zapped from the repeat, high speed efforts. It is not for the first-time runner on the track. A runner definitely needs to be used to speed workouts in order to try this really intense workout. All in all, we did see some personal bests happen about 2 weeks after this workout. I can't link it totally to this ONE workout, but it certainly helped some athletes in how they managed their speeds and got used to running a bit uncomfortably at race paces. Some kids told me it was the hardest speed session of the season. I'm looking at making a more specific Kindle guide for this workout system, as its pretty unique and could be helpful for those looking to shave off some time on a 5K or even for tracksters on their 800, 1600 or 3200 times. As for now, I'm still experimenting with this workout routine and developing a strategy on doing it as part of a main running plan for race improvement. 200 every minute x 4, rest 1 more minute, do it again at the 5:00 mark. 200 every minute x 4, rest 1 minute. Finisher: 400 in 82, rested until 3:00, then did another 400 in 77 seconds. All in all, this was 2.5 miles of some very fast speed intervals of 200's in the 38-42 range. One section I was able to glide with the wind to my back, getting 37's sometimes. Then the next one I had to go into the wind and barely get a 41-42 time. Its a great mental edge builder because there isn't much time to whine, you just push yourself through it. Weekly RAW: The RAKC Plan - Kettlebell-Only Routines! Starting up something fresh this week for a 4 week plan: the Rats Alley Kettlebell Club Routine. It is a typical M-W-F routine to handle. Just 2 exercises per day. On off days, I'd recommend a 20/10 workout from the HWR workouts, or doing a KB Swings workout, such as one from Just Swing It! or a workout from the Just Clean It! guide as a KB Cleans workout. KB Military Presses: 3 x 5 per side, or do 3 x 5 doubles at once. KB Cleans: 20s work, 10s rest per side, do 10 minutes of this for 10 sets per side total. It's pretty simple and pretty short, roughly 10-20 minutes per workout in all. Try to use KB's that are appropriate to complete each set but not be too heavy where final sets are too much of a struggle. Keep a rep or two 'in the tank' as they say. Revisiting the Roots of "Indy"
A while back I was reviewing "Just The Workouts" on my Kindle app, re-reading one of my first Kindle guides that I put out. Even though "Just Swing It!" has been my top seller, JTW was the top seller from day one when I started making Kindle guides. It is still a solid #2 overall in my sales of all my guides. I am seeing a mini-movement in the fitness field where its gone full circle. We started with 'traditional' lifting, such as bench, squat, deadlifts, to machine based stuff. Then, machines were horrible and terrible and seemed to cause everything but cancer, and bodyweight and 'functional' exercises on stability balls and balance tools were all the rage. Kettlebells hit the mix soon, and then people went full bore into that. I was one of them for a bit, but I saw them more as another tool, rather than a stand-alone-only tool. Then it seemed that Crossfit was the new, cool thing to do and anything else was horsecrap according to some CF people out there. All in all, the basic program I first started with in high school and always saw a chart of, tucked in the corner of the weight room, is still around. "Just The Workouts" is based on this program, because when I'd go to Mayville State for my first two years, the same program was there. Go to Southwest State for another 2 years, the program was there. I came back to Mayville and the strength coach I worked under as a student coach said to me, "I don't know who made this program, but it works every time." That's why I've dubbed it, "The Program That Never Left The Weight Room." That always stuck with me and years later, I'd train a guy who went on to play at Mayville State for football. They sent him the program, and low and behold, it shows up again. I called this program the "Indestructible!" program in my JTW guide. I also took phases of "Indy" and tweaked it to the 4 week phase program of the RABC Manual, so the roots of the RABC plans are based off of Indy. I wanted to share this story because I'm not sure how many have heard it through the blog. My main message is that the more things change, the more they stay the same, and programs like Indy have stood the test of time and prove to be a winning plan. Grab a copy of JTW for only 99 cents on your Kindle readers at http://tinyurl.com/rkofp or at http://occupyfirstplace.com Don't forget about the handy "Just The Chart" guide too, as all you have to do is tap on your maximum weight as a chapter, and all your weights come up for each week/phase on every set and rep scheme. Grab all 3 (RABC, JTC, and JTW) for less than the cost of a Starbucks coffee. Taking a break for a week or two with the postings of weekly workouts. I'm getting into the heart of track season as a coach too, and things are about to pick up a lot. In the meantime, check out the RABC BSD Plan up above if you haven't done so already. There are also KB Swing programs to follow to help you gear up for a 10,000 Swings Challenge. The "Just Swing It! ", "Just Clean It! ", and "KBXL" guides have been doing really well lately in Kindle guide sales. Many of my guides have been in the Top 100 of Sports & Outdoors sections of the "Kindle Short Reads" picks. Take a peek at these guides that many can be finished within an evening or under an hour, for sure. Freebie Weekend: TAC on Kindle! If you are into speed training and want a unique edge to it, you can get a free guide this weekend on your Kindle that covers how to gain that edge. If you've seen GPS speed monitors and wondered how they can be used to help improve your speed, this is your guide! "GPS is the future of speed training...and it is here! Discover new techniques to apply to traditional speed training programs and use GPS speed monitors to deliver better results for you, with "The Acceleration Code" ! Coach Rick Karboviak, a leading innovative coach with GPS speed monitors, takes you through the breakthrough methods that GPS speed monitors can provide you. You will evaluate your speed training workouts, sprint by sprint, workout by workout, week by week: enabling you to fine tune your training more specifically than ever before! No more using stopwatches to guess your effort over just time alone, as the GPS data gives you instant feedback in MPH and more data that you could ever imagine being measured over a speed workout! Let Coach Rick take you through a series of workouts that use GPS speed monitors, a track or playing field, and he even tosses in a kettlebell to the mix for more power & explosion to your sprinting. Designed for the 'everyday athlete' who wants to get faster, "The Acceleration Code" is your next tool in creating the edge you need to succeed!" Grab your copy today (Saturday) and on Sunday from the Kindle Store! Do 1 arm swings for the KB Swings, 1 arm Cleans, plus 1 arm Push Presses. Here is next week's schedule for Week 4 of the BSD Plan. Don't forget to print off your log sheets from the tab up above. The snow is melting away, now the ground is soggy, but the outdoor track season has started! Personally, my running is going very well now with the gluten-free changes I've made. There have been some longer runs with the track kids I've been able to do fairly well now. Just a little discomfort at the end, but my times are better than I thought they would be. On some out & back runs, I can go out easy and come back at a faster time overall. The weight loss has kind of hit a standstill, close to 20 pounds lost now since January with some fluctuations of 2-3 pounds to 17-18 from that January weight. I'd say the biggest change is in energy levels during a run, I don't feel so zapped any more and things just flow easier. I still face some issues on some days where gluten is just unavoidable, but in the bigger picture, its still a lot less than what I used to consume on a daily basis. Minimization is key, not total elimination, as I've discovered. I'm going to just add a few workouts throughout the week, maybe just a 10 Minute Tuesday and Fantastic Friday workout this week. Here is today's Fantastic Friday workout for you. This is a quick little total body, 10 minute routine. Use a moderate KB weight to complete the routine. Rest 1 minute, then repeat entire circuit. Here is Week 3's plans for the RABC: Bench-Squat-Deadlift routine. For log sheets, hit the page tab up above for the BSD Plan. Look out for Daily RAW's of 10-Minute Tuesday, Wild Wednesday, and Fantastic Friday routines, later to come this week. Its another GymBoss & Kettlebell Day! Repeat this 3 exercise circuit for 5 times total, completing a 15 minute workout. Use a moderate KB to perform the exercises, doing 1 arm alone for each 20/10 period, switching every 30 seconds from arm to arm. Time yourself for 10 minutes on this workout. Perform 5 BW Squats, followed by 5 Push-Ups. Keep performing sets of 5 on each exercise, resting as you wish, and recording your total reps for the workout. Keep this number on-record for a future challenge day. You know I'm not a 'cardio is evil' type of guy, as I'm an active runner and cyclist who enjoys it. Some days though, you don't feel like a cardio routine and maybe you are in need of some brief, short workouts to give your body a break and re-energize your entire plan for a phase of your training. Craig Ballantyne is having a sale on his Home Workout Revolution program this week, Tuesday April 1st through Thursday, April 3rd. It is a very timely deal, and definitely NO April Fool's joke! This program which usually goes for $67 ( great deal on its own, especially in comparison to programs like P90X, Insanity, and others that are in the $120 range), however, its on sale for a tremendous price of just $27! 51 no-equipment workouts with INSTANT video access to log into! 20 more workouts of 6 and 4 minute circuits for more challenges to do! There's no shipping, no waiting, just get instant access to the videos & guides to get started right away! You can't get that with other DVD & guide program collections, sometimes the first payment alone is more than $27! HWR has been a staple of my workout agenda, year-round, because it fits in so well with a busy time schedule I have with a full time job and coaching teams all school year long. Sometimes 10 to 15 minutes is all you have, and HWR will be all you need to get something done in that time frame. It's Tuesday, and its no April Fool's, either. Its 10-Minute Tuesday! Choose a KB weight that you can do throughout the whole circuit, switching sides every 20/10 in the workout. Use a moderately heavy kettlebell to challenge you, but not tax you right away. If its too heavy as you start, simply go lighter on the next exercise. Here's Week 2 of BSD up for you. Remember, log sheets for this are up in the pages section at the top of the blog under the "RABC Bench-Squat-Deadlift Plan" tab. All Star Sit Ups & Windmills: 20/10 x 2 each, rest 1 min, then repeat. Leg Raises & KB Swings: 20/10 x 2 each, rest 1 min, then repeat. Mountain Climbers & TBE's: 20/10 x 2 each, rest 1 min, then repeat. Look for Workouts on Tuesday, Wednesday & Friday once again in the upcoming week. CT-50 is making waves, as its a great alternative to CrossFit, or if you have trouble getting to boot camps or a gym's offerings, many of the workouts just need some minor equipment to get the job done. It's one heck of a deal at only $37, less than 1/3 the cost of other mega DVD offerings you see on TV. (I think you know which ones I'm talking about.) This program has great progressions and is NOT just another mish-mash of various workouts to do. Here's a Fantastic Friday Workout for you today. Gymboss Timers are awesome for 20/10 workout formats. Either find one online, or do an App search on your phone/tablets for the Gymboss timers that are free on there. I have both, as sometimes the timer itself is handier out on the track, the road, or the bike. If you know anything in the fitness industry, its that Crossfit has taken things by storm. Gyms or 'boxes' have opened up throughout the country and there is a wide variety of options. I, myself, and not a fan of this method/program, or lack thereof in its programming. Its one of the reasons I went with the FitRanX program to implement to people I train locally, because it has a progressive system within it. I could rant about this, but rather than kick up dust, you can make that decision on your own by researching it and discovering more for yourself. In my own research, this new program I've found has all the tools you need for solid, progressive programming and moving up in fitness levels. That, to me, is what counts: a program needs to progress you, not just make you feel like you're drop-dead tired. I came across a newer program called CT-50 from Tyler Bramlett, and its got a mix of CF style exercises and a host of other exercises/workouts, but are done in a highly progressive plan of action for you. Not all people can go to a gym, and they end up working out at home. I feel as a part of my blog, its not to get people to the places where I train people, its to help inform them of how they can workout BETTER on their own. One of the programs I am a fan of and highly do is the Home Workout Revolution program from Craig Ballantyne, found at http://tinyurl.com/cbhwrevsale. Tyler's new CT-50 program is quite possibly one of the best collections I've seen as far as what you totally get from his offerings. In a nutshell, its a plethora of guides to help you discover where to start and what actions to take right away. There are also videos to download instantly (once you get your access rights) and view right away, available to download and burn onto your own collection of DVD's to play. I love programs like this, because then I can customize my own DVD's and not have to pay for a set collection that has workouts I don't enjoy. The CT-50 program is $37, and is available with other bonuses if you wish to add them on. At 1/3 the price of most high priced DVD collections of workouts that are sold out there, CT-50 is a great deal all-around. As always, I check out the programs before I sell them on my site. This is one of the better deals you will find anywhere online for at-home workouts to get after and customize for your goals! When I have 20 minutes and want to get something out of my cardio in a quick hurry, this one workout has been a staple of mine for the past 10-12 years. I apply it to running, biking, or any other cardio machine if available, but most of the time its been running specific on a track or the road. 4 minutes of 20/10 hard/easy running. My 'Hard' feel is 5K to mile pace feel. 4 minutes again of 20/10 hard/easy running (8 cycles of that). 4 minutes easy pace or walking as a cool down. If you go on an 'out and back' run on the road a lot, this one is easy to do if you turn around during the 2nd 4-minutes of easy pace, basically at the 10 minute mark. You usually end up coming back sooner if you go fast enough on the 20 second periods. Not all the time, but some of the time this happens and you can end your workout a bit sooner this way. Repeat the above circuit one more time in succession to get this in within 10 minutes. Another 10 minute routine to add is doing a basic KB Swings Challenge, as a lot of the daily Swing workouts are done in 10 minutes or less, sometimes a bit more. Here's the weekly schedule for the RABC Bench-Squat-Deadlift Plan. Don't forget to download the free handout copy with workout sheets up above in the page tabs. 20s work, 10s rest x 2 each exercise. rest 1 min, then repeat. 20s work, 10s rest x 2 each exercise, rest 1 min, then repeat. Look for 3 other workouts this week, such as Ten Minute Tuesday, Wild Wednesday, and Fantastic Friday routines. Just Added Above: 2 Free Programs! Look for those links on the above page, but they are also provided for you in this blog post, too. I'm looking at following the BSD Plan in the next 4 weeks on the blog, so if you want to follow along, simply print off the program, and make sure you have your resources of the RABC Manual and Just The Chart handy on your Kindle readers/apps too. Don't have those two guides? Check 'em out at http://tinyurl.com/rkofp for only 99 cents each. Just Swing & Clean It! On the Swings, you may do 10 per side and continue alternating arms every 10 until you reach 40 total. On the Cleans, you may do 5 per side and continue alternating arms every 5 until you reach 20 total. Grab a moderate KB weight, most females might be fine with 15-25 pounds, guys 35-45 pounds. Single Arm KB Swings are the focus. 10 Left, 10 Right = 20 reps, switch arms after 10 on your left. 20 reps should take about 35-38 seconds to do. 40 reps should take about 70-80 seconds to do. With each format, you will get a fair amount of rest between sets if you want a quick drink of water. If you have a GymBoss timer, just setup the intervals for 1 minute each, or just watch a stopwatch and go at the top of each minute or two minute period. GymBoss timers are great, and they even have an app for your phone that's free. I believe its both for iPhone and Android systems, too. If you got 20 minutes, give the workout a 2nd round if you would like. Here's Week 4 for you of the RABC Plan for next week. I will still get some 10-Minute Tuesday, Wild Wednesday, and Fantastic Friday routines for you later in the week. Those were pretty well read this past week. Probably have heard this from me before, but I hate how running gets lumped into 'slow, boring cardio' all the time by fitness professionals. 1. They always compare a sprinter's physique to a marathoner, saying how one is more muscular, and the other is more thin and sickly looking. Just because we run, it doesn't mean we are all marathoners! Quit this crap, fitness pros! There are plenty of 5K warriors like me who don't run marathons. 5K's are more abundant and easier to race/compete in locally, so stop lumping all runners into one category. Case in point: Over 20,000 will do the Fargo Marathon's 5K event, while their main Marathon itself is capped at 2,000. That's 18,000 more people than a marathon who will do the 3.1 mile race. So, stop this madness, please. We are all not marathoners, so quit the comparisons already. You're wrong. 2. They will compare cycling and the elliptical trainer as being equal to running in the 'slow, boring cardio' section of training. Running is not the same as cycling, cycling is not the same as being on an elliptical trainer. This is like saying dumbbell lifting is the same as kettlebell lifting and they are both the same as barbell lifting.... There are similarities and differences between all forms. I can do things with kettlebells that I can't do with barbells. I can do things with dumbbells that I can't do with barbells or kettlebells. So, stop with the 'This is equal to That' comparisons! Quit marketing things with false images. 3. After bashing 'slow-go cardio', they will then say that INTERVALS ARE THE BEST FORM OF CARDIO, EVER. I would have to agree with this, but interval training is not something to be done every single day, either. All of those workouts are Interval workouts of varying durations, but they are not ideally to be done every single darn day of your training week. With the above workouts, I maybe do two interval speed training days per week, because the body isn't made to handle such high intensities on a daily basis. Even elite runners don't do multiple interval workouts in a week, they intersperse them with longer, slower runs to help with recovery and work on other aspects of their fitness. One way I do some of my workouts in the summer are interval workouts on the track, with bike rides on days in-between, going moderately over the natural hills and terrain/weather I am facing (windy days around here make for some hard riding on its own). My bike rides are the easy days, the interval workouts are my harder track days. Some fitness pros will frown on long, slow cardio, but I have rediscovered its benefits throughout the years and no longer agree to the "intervals or nothing" mindset that some trainers have. I don't agree with high mileage programs being a solution, but I do agree with high quality workouts being the solution instead. All in all, I am getting sick of seeing fitness professionals bash the sports of running and cycling all the time in the name of marketing the Six Pack look. I guess whether I have a six-pack or not is not important, I'm just worried about where the heck I finish in a race in the end. No one gives me a trophy for a six-pack, they give me a trophy if I earn it by time and placing high enough. Not all people run just to lose weight and get into shape.... we run because we love to race, too. RABC "Just The Freebies" Weekend! Enjoy one of my best sellers in JTW, and JTTW is a bunch of former 99 cent guides, squished together into one collective format of "just the track workouts" from those guides. Either click the links above, or check out all the guides I have to offer right HERE. Look here later this weekend for next week's RABC Weekly Plan. As part of Fantastic Friday, I am giving away two Kindle guides over the weekend. I will announce it on the blog on Saturday morning, but you can see firsthand Saturday morning on my author page at http://tinyurl.com/rkofp . This should take you 18 minutes to do. Its a good kettlebell routine to give it go, use a moderate KB or even a lighter one at first. Recently I found a new spinning bike at Sears on a great floor model clearance price. An $800 bike sold for $300 at first and down to $115 at the price I got it for. Its a Bladez SX Pro indoor trainer, and its a great addition to my workout lineup. Its very smooth and the closest I have experienced on a stationary bike to what a real bike feels like. I mention this because I like good old cardio routines. I am one of the few people left who think that regular 'cardio' isn't a terrible thing. Not every workout has to be an interval blast-o-matic workout that leaves your tongue hanging out, drenched in sweat, like some infomercials have you believe. I do perform interval routines, along with regular, steady state cardio workouts of the running and cycling nature. I enjoy a pleasant ride in the countryside, using hills as my natural intervals, and winds to either resist or assist on my ride. I also enjoy a nice easy run to take in the best of nature on its wonderful days you get now and then outdoors. I just wanted to mention my bike because its a nice change from the same old stuff that people can get stuck in. It is also beneficial for aiding recovery, going at a nice easy pace, something of a lower intensity to help increase blood flow to your muscles without damaging them repeatedly with high intensity routines. Today's will follow the 20 seconds work, 10 seconds rest pattern (20/10). Looking for something more to finish off your workout? Try the new Bodyweight Finishers from Mike Whitfield. A lot of times you get barraged with program after program, and you don't know what to do next. What if you could just take your favorite routines and amp them up a bit more with a finisher? That's what Mike has done: he's created a lot of add-on routines (video included!) that you can start reading ASAP and even add some to your very next workout, even tonight's routine. Best of all, its only $19 right now! Workout guides plus videos to instantly watch for only $19? That's a heck of a deal to take advantage of. Last week I revisited an old ab routine I did in my HS days, covering how it used to take me about 15 minutes to do. Well, here is my suggested upgrade to the workout plan. The original called for 7 exercises, done 3*15 for each and building up to 3*25 over the course of 12 weeks. With the success I've seen from the 20/10 work/rest workouts, I feel it is worth looking at seriously as the format to follow with this old type of ab workout. Here is a new look at an old program: kind of like taking a classic ride and hot rodding it up a bit. Ab Crunches are the basic crunches where you lie down, crunching up and taking your shoulders off the floor. Leg Raises are where you lie down, hands under your rear, taking your legs straight up to 90 degrees and back down. Mountain Climbers are taken from a pushup stance, taking your knees up towards your chest, one at a time. Toe Touches are where you lie down, legs straight up, and take your hands up towards your feet, trying to reach your toes if you can. Cross Body MC's are Mountain Climbers where you take your knee towards your opposite elbow in the mountain climber motions. Total Body Extensions are a full body squat to full extension at the top. Raise your arms up as you reach the top, drive your arms back as you squat back down. Don't jump on the extension, rather, extend up on the balls of your feet as your fully extend up after the squat. T-Twists: From a pushup stance, take one arm up towards the ceiling then back down again, alternating arms for the duration. Kneeling Superman's: kneel down on all fours, taking your left arm up at the same time as your right leg. Alternate sides for the duration. Side Planks Left side: From a pushup stance, do a T-Twist to your left side (left arm up towards the ceiling) and hold it at the top. Side Planks Right side: don't he right side to finish it out. This routine goes from a 6 minute circuit to 8, then 10. 3-5 times a week would be plenty for most people to add a routine like this to their plans. Get a Gymboss timer to whip through a 20/10 work/rest pattern, or even find the Gymboss timer app for your phone or tablet. The app is free and you can set timers for any work/rest pattern you desire. If 20 seconds seems like too much, try 15 seconds work and 15 seconds rest for a good 1:1 work/rest ratio. All in all, jot or print this out for a good little Ab and core workout if you are desiring to add one to your routine. Still going Gluten Free when I can, and its making a great difference in how I feel and look. Dropped 15# now totally, seemed to hit a happy point and not so worried about a set number. I have a feeling that once I get outside more and run in nicer weather, the weight will come off a little more, but not much. I've gone from 202 to 187 now, and I think between 180-185 will be a good weight to be at for my performance. Some days I just can't get around gluten foods, so its not the end of the world. On the bright side, I am no longer snacking on crackers and cookies that used to contain a lot of it. Replacing the chips with rice cakes and rice crackers/snacks has been a nice change. Running-wise, its feeling a lot better for me and I'm anxious to crank out a workout on the track on the first cleared-off track day we have. I'm looking at doing some core workouts & full body workout circuits of my own as additional workouts to add to the blog on a semi-daily basis. Still hitting up the Swings now & then, even in the start of track season. Mostly up to just BW workouts at the end of our runs. I'm finding the 20/10 format is one of the better templates to use for various workout needs. Grab a bunch of great 20/10 workouts plus many others on video with the Home Workout Revolution series at http://tinyurl.com/cbhwrevsale . I have used these workouts to fill in a great need with my busy schedule. Of course, you'd gradually increase the reps each week as a way to build up to this. It was a great program to develop my non-developed abs at the time, but it also ate up a lot of my training time, mostly up to 15 minutes a day is what it would take with minimal rests between sets. I didn't do all 7 exercises, but did double up on a few of them back then, so I would still get in the total volume. This ab workout was great for my abs, but terrible for my back at the time. My abs were a lot stronger than my back and this was something I finally became aware of during my college days. I learned more about exercise balance and strengthening opposing muscle groups and trying to get them as equal as you can. These days it seems there are a bunch of workouts out there that have you saying NO to crunches and getting 'ripped abs without crunches!'. Most of them are fluffy bullcrap, but some of them attack the core with full body exercises, as they should. One of them is Home Workout Revolution, which you know I'm a big fan of. The 4 and 6 minute circuits they have for ab/core workouts are solid and well balanced. If you are looking for something that won't eat up your time and be easily applied to your routine and goals, the HWR 4 & 6 minute workouts are right up your alley. Check them out here, as the HWR series is a solid, top to bottom, workout routine that is the best value of fitness workout videos and programs I've seen.